Stuart will be joining a wonderful lineup of performers at St. John's Coffeehouse in a benefit for "A Special Friend for Anelise." This is a series of benefit shows and events to help raise money for a service dog for Lori Diamond's daughter Anelise. Many of you know Lori as a longtime collaborator and contributor to Stuart's last album "Love Songs and Other Tall Tales." Lori's main gig is being a mom to three wonderful kids. Anelise is a wonderful young lady who is in need of special friend to help her as she moves forward with life's challenges. 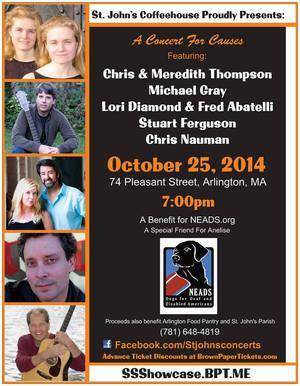 Here is a chance to take in a night of great music and help out with a worthy cause. Come out and enjoy a great night of music with Chris & Meredith Thompson, Michael Gray, Chris Nauman, Jackie Damsky, and Lori Diamond and Fred Abatelli. Tickets are $15 ($16.52 with service charge) in advance online at Brown Paper TIckets and $18 at the door. Even if you can't make it to the show, you can help out by sponsoring Anelise at the link below to donate at NEADS: Dogs for Deaf and Disabled Americans.